Explosion of colour: Capetonians came out in their droves to support the annual Color Run, who chose SHAWCO as its local beneficiary. 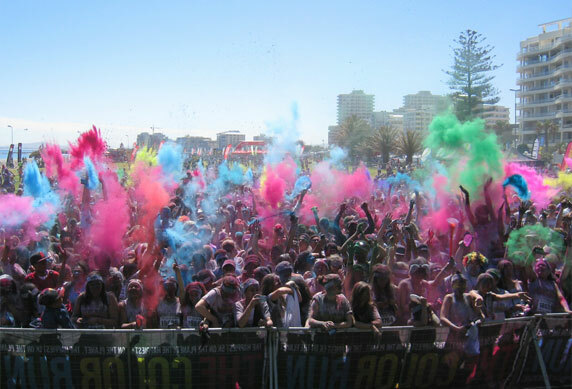 Held amid a sea of colour on the Sea Point promenade, some of the proceeds of Cape Town’s first Color Run will benefit the communities served by the student volunteers of SHAWCO. SHAWCO is set to receive a major cash injection after becoming the local beneficiary of this event, which took place on Saturday, 19 October. The Color Run is a five kilometre untimed race in which participants are doused in brightly coloured powder at each kilometre mark. Medical student and SHAWCO volunteer, Theresia Rubler, recognised the Color Run as a possible partner for SHAWCO. She initiated contact with the organisers and, after careful consideration, SHAWCO was selected. According to the Color Run organisers, they had no strict criteria for selecting a beneficiary – other than that SHAWCO’s work matched the Color Run’s ethos. Approximately 12 500 people participated in the fun run. The first of these themed races took place in Phoenix, Arizona in January last year and the event quickly grew into a worldwide phenomenon. This year the colourful fun runs are expected to be hosted in 30 countries and should attract one million participants. Port Elizabeth hosted an event in September, and in December it will be Johannesburg’s turn. The organisers always select a local charity as beneficiary. 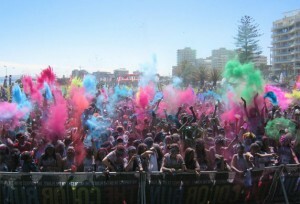 “The Color Run is set to become a regular feature on the Cape Town race calendar. We are very happy to be associated with it. If all goes well SHAWCO could partner with them on an annual basis,” says Greer Blizzard, SHAWCO’s fundraising and PR manager. SHAWCO used the occasion to launch its Change a Life fundraising campaign. This campaign saw Prezence Digital – a multimedia agency – develop both a SHAWCO micro- and mobisite pro bono. The sites make donating money to SHAWCO Health a lot easier and more convenient. “We also took 30 learners from our Star education project in Manenberg take part in the Color Run. They thoroughly enjoyed themselves. There were smiles all around,” Blizzard adds.